Played along with the SUDSOL Chat & Challenge tonight for inspiration. This layout is very similar to the sketch we were given, and a Spring theme was suggested. With all the snow around here, I'm all over Spring!! The card base is Chocolate Chip and opens from the bottom, not side. I like to do those on occasion to be different! The next layer is Pretty in Pink. 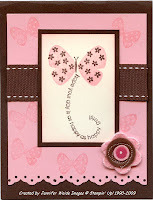 I used the Eyelet Border punch across the bottom, and stamped the small butterfly along the edges in Pretty in Pink. A 1" Chocolate Chip grosgrain ribbon is around the Pretty in Pink layer near just above center. The main image is 2-step stamped on Very Vanilla. The solid is Pretty in Pink. The flowers were added using the Stamp-a-ma-jig for perfect placement in Chocolate Chip. I also used the stamp-a-ma-jig for the words to get them where I wanted. The edge of the Very Vanilla layer is sponged with Pretty in Pink. Lastly I added a new embellishment from the Occasions Mini Catalog. Felt accessories called Sweet Pea. It has a couple flower pieces, centers & leaves. Very cool!! and of course coordinates great with the other new items in the mini! HAPPY NEW YEAR TO YOU, JENNIFER!